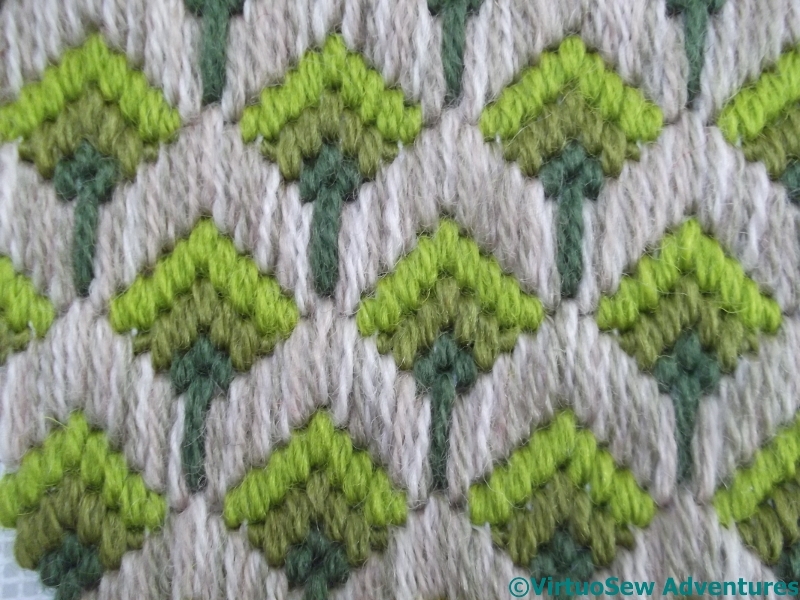 This tree pattern is one I’ve been looking for an excuse to do for quite some time. The book in which I found it suggests using it for small pieces like spectacle cases, but I’m not sure I agree. I think it might make for a rather overpowering pattern if not contained by something else. 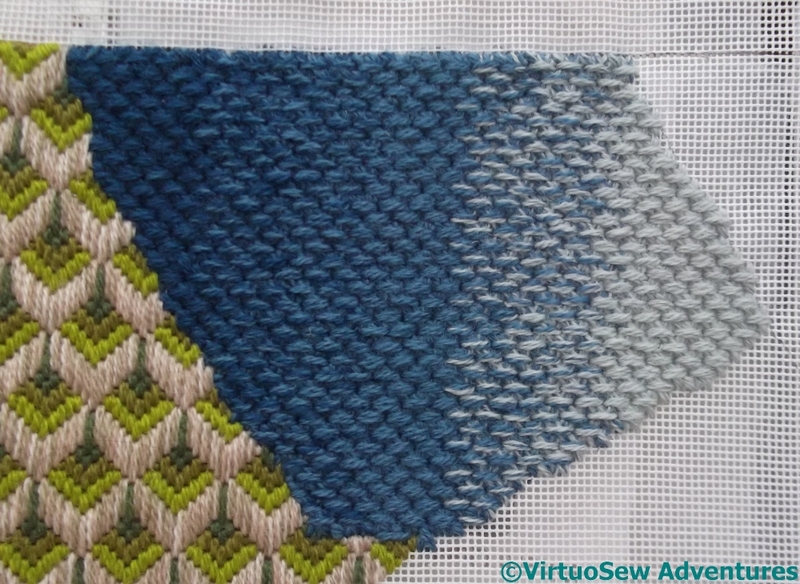 That same book said it was easy, and I’m not sure I agree with them about that either – I had to unpick all the trees the first time I did them, because I’d repeatedly got one element of the stitch placement wrong, in a rather unfudgeable fashion! Section Seven covers – just – the whole width of the cushion, and makes a good interruption to the rhythm I’d built up. It occurs to me that it might be a good candidate for a single colour design, one of these days, especially a light colour that will allow the ends of the stitches to cast shadows and build up the pattern. As though I don’t have enough plans swirling in my head! It turned out that the next section was rather tricky to pick a colour for, until my mother suggested blues, to help reflect the pattern around Section Seven. I decided to create a shaded effect on Section Eight. I used three strands of wool, which meant that I could create a fairly subtle graduation starting from three dark strands, and progressing through 2 dark and 1 medium, 1 dark and 2 medium, 3 medium, and then 2 medium and one light, 1 medium and 2 light, then finally 3 light. 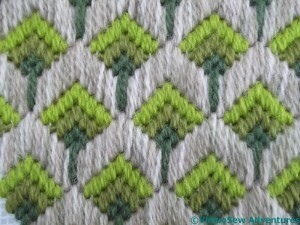 The stitch is Dutch Stitch, found in Mary Rhodes’ Dictionary of Canvaswork Stitches. 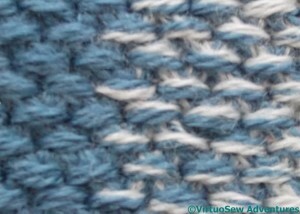 It is a condensed, closely worked crossing stitch. In fact it is so condensed as to be quite an effort when worked in three strands on this canvas! Still, I expect it will prove a hardwearing stitch, and the texture is a good contrast with the smoother textures of the straight stitch patterns. Both lovely. 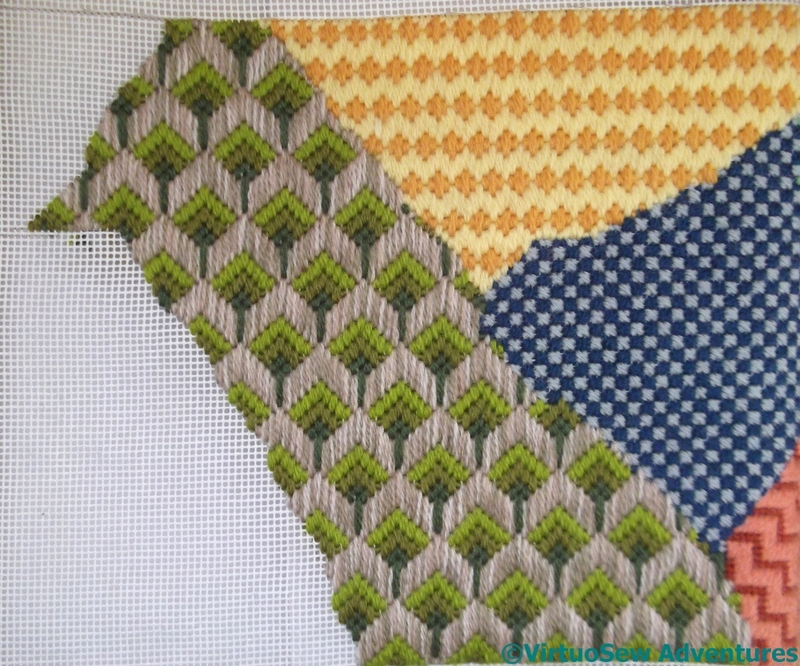 The Trees pattern actually looks like tumbling three-dimensional blocks from any angle but the right way up. 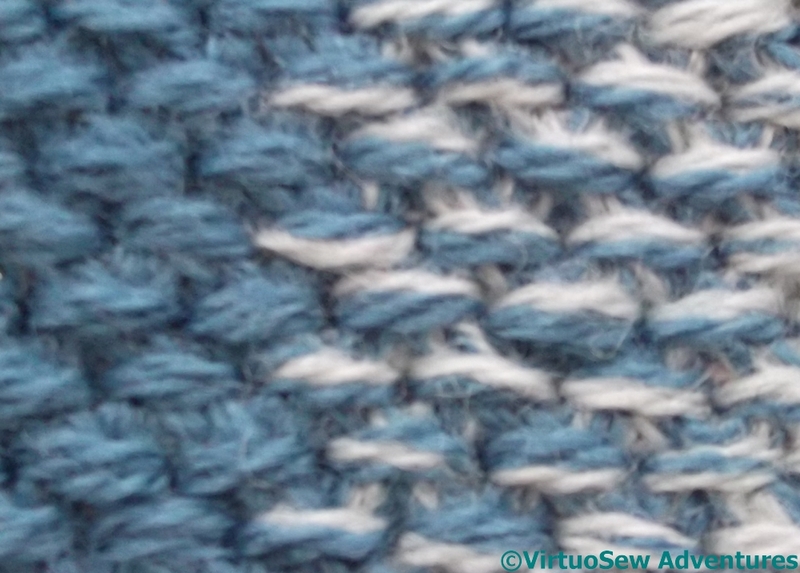 And the Dutch Stitch looks just like knitted garter stitch. The blues either side of the Trees will help to balance out the Oxbridge section you were worried about. You’re over half way now then…. You’ll have to find another project to work on soon! Very nice. I really like that tree pattern. I take it you’re not feeling distracted today. 🙂 Well done, it’s coming along very well. Oh I will have to try that tree pattern, very nice. 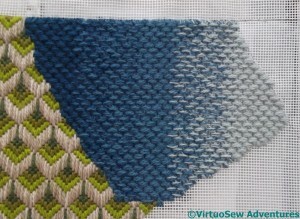 The gradation of colour in the Dutch stitch is most effective. Rachel – those trees are divine! I would love to use it in miniature for a card aperture too. The trees are gorgeous but what I really love is the blue shading. Beautiful tree pattern, a 3D look. 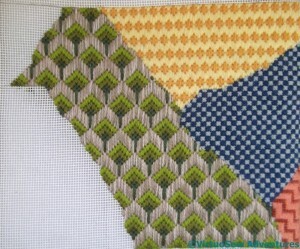 The shades stitches are pretty as well. The greens and blue look great together. Good on Mum!